Fifteen years ago, cell phones were bigger than some modern laptops and no could have imagine having their own 100 GB of information. Now, cell phones fit in a pocket and are able to do things that seemed impossible before. No one knows for sure what technological changes the future will bring, but it sure is fun to think about. 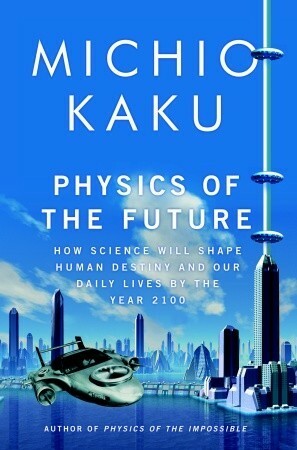 The Physics of the Future: How Science will shape Human Destiny and our Daily Lives by the year 2100, by Michio Kaku. Computers will be controlled by tiny chips in our brains, cars will drive themselves (possibly fly themselves, too), and spaceships the size of a needle will allow science to see other planets and stars. These are just some of the predictions Kaku makes in this quite-literally forward thinking book. Futuring: The Exploration of the Future, by Edward Cornish. Instead of making his own predictions, Cornish explains how others identify trends in modern science and technology in order to make your own informed predictions. A Different Universe: Reinventing Physics from the Bottom Down, by Robert Laughlin. Laughlin, a Nobel-prize winning physicist, talks about the future of physics and where science is general might be heading over the next few decades. Pulse: The Coming Age of Systems Inspired by Living Things, by Robert Frenay. Beginning with some existing examples, Frenay shows ways that technology could imitate life to work more efficiently. Profiles of the Future, by Arthur C. Clarke. Writing about the future isn’t new by any stretch. Here, Arthur C. Clarke, one of the fathers of modern sci-fi, made his predictions from back in the 80’s about what the future would hold. See what he got right. What are you most excited for from the future? Personally, I’m looking forward to replicators and teleporters. Anything to help me eat better and cut down on the commute.